Feel free to register here. For one reason or another, valance clips are the most common hardware request. Plastic clip that attaches the valance to the headrail. We have 2 types of valance clips: 1" Metal valance clip-standard for all Premium 1" metal blinds and 3" valance clips, standard for all 2" and 2 ½" products. Some of the styles have changed and the manufacturers can no longer provide the matching hardware. Attach valance clips to front of head rail. Push down to snap in place. Make sure to install one clip on each end, and space others evenly, no more than 48" apart. Replacement valance clips for one-inch mini blind. Product Description Made for aluminum mini blinds. These are designed to hold 1" valance strip. Product Description Made for aluminum mini blinds. These are designed to hold 2 valance strips. Replacement clips for wood valance . Item Name: This strong round magnet replaces existing plastic valance clips. Sold individually. Comes with one mounting screw. Product Description Magnet attached to wood valance for metal head rail. Comes complete with small set screw, one magnet per order. 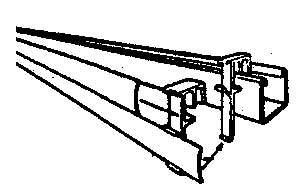 Product Description Plastic clip that attaches the valance to the headrail. Unlike most clips, this attaches to the back of the valance. Product Description Must have a groove in the back of your blind for this clip to work. Back to Top This clip is designed to raise most valances above the headrail to conceal the gap between the blind and wall. Item Name: Adjustable valance clips for wood valance. Product Description This clip attaches to the back of certain wood and faux wood valances, this clip is adjustable to raise or lower the valance. The Site is operated by Blind Parts NW LLC. Our prices for restringing and repair services are very affordable and will save you from costly replacements! Copyright © 2006-2017 The Blind Repair Shop LLC All Rights Reserved.